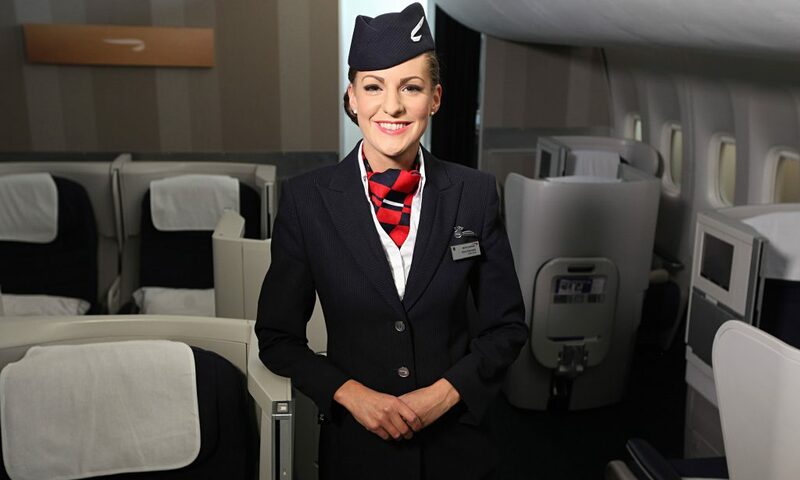 Ok, so last time we met Stephanie she had just been invited to take part in the British Airways online tests (eek!) So, let’s go and find out more. Ok, so as the title suggests, you are given a range of work-related scenarios and you have to choose what you think are the most effective and least effective solutions to the scenario. You are given a practice question to allow you to understand what they are looking for and then it’s into the real thing! I have to be honest, some of the scenarios were quite difficult and I really had to think about it as the answers certainly weren’t obvious and there were times when I swithered between one answer and another. My tip to you would be to eliminate the least effective option first of all (i.e. the worst solution) and then think about what would be the best solution between the two remaining options. Another thing I would advise you to do, is to really think about what cabin crew do and learn as much as you can about the role before applying. Remember, that the key role is safety on-board and you should always bear this is mind when answering these scenarios. So, for example, there is a scenario relating to a passenger who won’t do up her seatbelt before take-off. Passengers must fasten their seatbelts when the seatbelt sign is fastened, and cabin crew cannot deviate from this rule so you would need to INSIST that the passenger fastened her seatbelt or she wouldn’t be allowed to travel. So, the more you know about what cabin crew actually do, the better prepared you will be for this section. You also need to make sure that you understand how important good customer service is to British Airways and the more you can demonstrate your understanding of this in these scenarios, the better you will do. 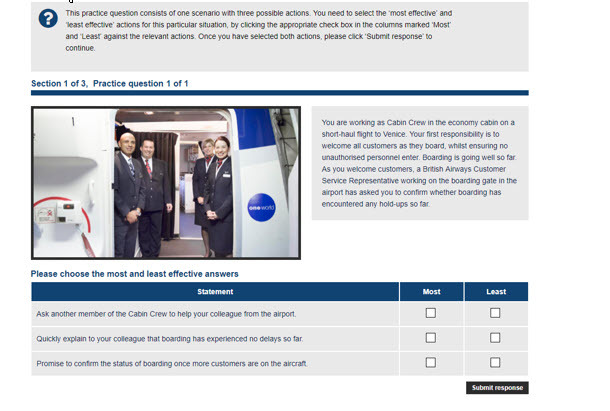 There are 15 scenarios in total, so you really do need to know a lot about the role of cabin crew. 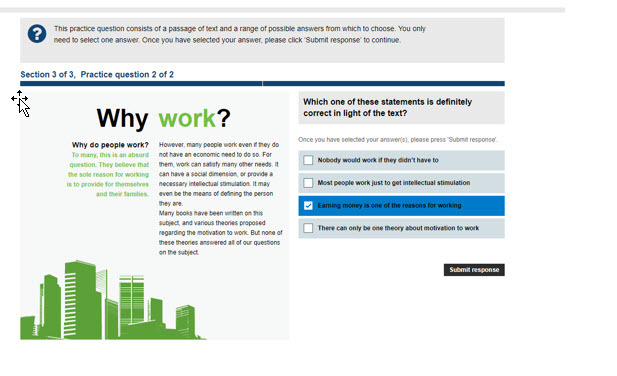 After this you move on to the next section where your working styles will be assessed. This is effectively a psychometric test which is basically a personality test, to see if your “personality” fits with what British Airways are looking for. You had to decide if a statement was completely untrue, fairly untrue, neither true or untrue, fairly true or very true. As you can see, I chose very true for 2 and fairly true for 2, but it wouldn’t allow me to do this as you are only allowed to choose each category once each time, which I certainly think made it more difficult. There are 12 of these questions in total and there are four statements in each one, so it did take quite a time to do it! Then we were on to stage 3 where you were given a numerical and language test. I was surprised at how difficult it was and to be honest, I think a lot of people will really struggle with it. There are 10 questions in total- 5 relate to your numerical skills and 5 test your language skills. 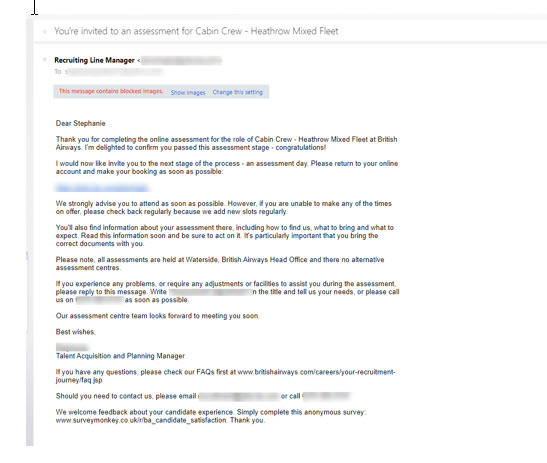 In order to be cabin crew with British Airways, you have to be a fluent English speaker and the questions they asked would be difficult to answer unless you had a really good grasp of the language. Because you are also dealing with money on-board your flights as well as bar and catering paperwork, you have to be good at dealing with numbers and that’s why your numerical skills are being assessed. You get the chance to try a practice numerical and language question. 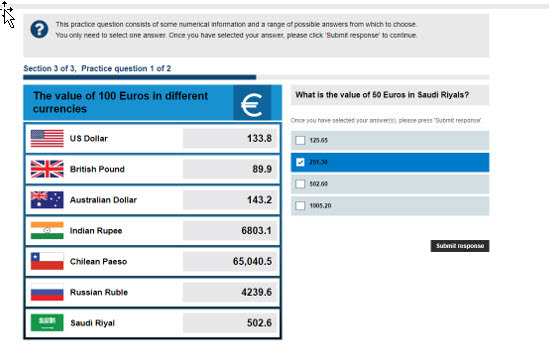 As you can see, you are given the value of 100 euros in a range of different currencies and you have to be able to do currency conversions. You are asked to read a passage and then asked a question relating to the passage. Please read what they are asking for very carefully and take your time answering these types of questions as they can be tricky. Now what makes this section of the application more difficult is that it is timed. So, you have 20 minutes to complete this section. There are 10 questions in total, so my advice is to spend two minutes on each question and if you haven’t got an answer in two minutes, then move on to the next one. The first few questions relate to local time in different destinations in the world and they were hard! I have taught this topic, but not for a few years and I have to admit, I found it difficult! You are then asked a range of currency conversions, so if this is not your strong point, please download my FREE currency conversion guide. You are then given five language questions, similar to the one above and that’s it- all of your online testing is over! All you can then do, is sit back, take a deep breath and wait to hear from British Airways! Hooray- Stephanie got an invite to an assessment day! So, let’s hope you’re next!